It is a truth that applies at every level: good food is about taking good quality raw materials and preparing them in a manner that preserves and enhances the essence of what they are. It is a truth that applies to the highest levels of restaurant cuisine – whether Ferran Adria’s Modernist Cuisine or Alice Waters’ California Cuisine – and to the home cook alike. I have previously written in this space that “the reputation of British Cuisine remains terrible despite the highest levels of its culinary achievements rivaling the best in the world” and that the solution was to “return the focus of English cuisine to the country’s natural bounty: wonderful meats and fish, locally crafted cheeses and high quality natural produce and other wonderful ingredients.” (http://sdfoodtravel.com/england-lamb-and-kidney-pie-with-duxelles/). Tracing the 20th history of England and its cuisine I observed that it was Britain’s “two World Wars and the disrupting years surrounding them” that were primarily to blame for Britain’s departure from its cuisine being based on the bounty of its land. And what a bounty it is. I always knew how wonderful England’s meats, vegetables and especially cheeses were. Had I thought about it I would have realized the seafood was marvelous too. A trip to Leigh-on-the-Sea underlined that point. 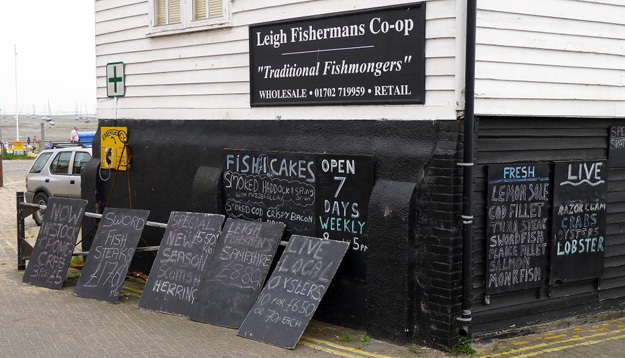 Leigh-on-the-Sea is a fishing village at the Southeast corner of England, approximately 35 miles east of London, near the mouth of the Thames. 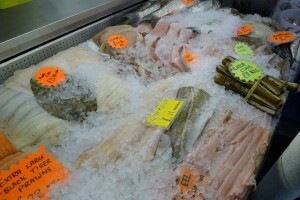 It is known for its shellfish – particularly cockles – and whitebait haul. Sharply tidally influenced, the waters regularly wax and wane with the Thames coming up to the city steps at high tide and leaving boats stranded in mud at low tide. When we first walked into the Leigh Fisherman’s Co-op, the sea scallops immediately caught the eye of Ian Oakley – my friend, business partner and our host in the UK. “Michael,” he said, “just look at those scallops – they’re gorgeous.” I could not disagree. In the States we rarely see scallops with their coral – what the Brits call “the quick” – still attached. This orange, fatty roe is, perhaps, the tastiest part of the sea scallop; and yet American fishmongers and processors routinely discard it, selling only the abductor muscle. “Why don’t we serve them with some black pudding,” asked Ian. Black Pudding is the English version of blood sausage – much like Polish Kishka or Spanish Morcilla. “Why not?” I asked. And a dish was born. What caught my eye was the Samphire. 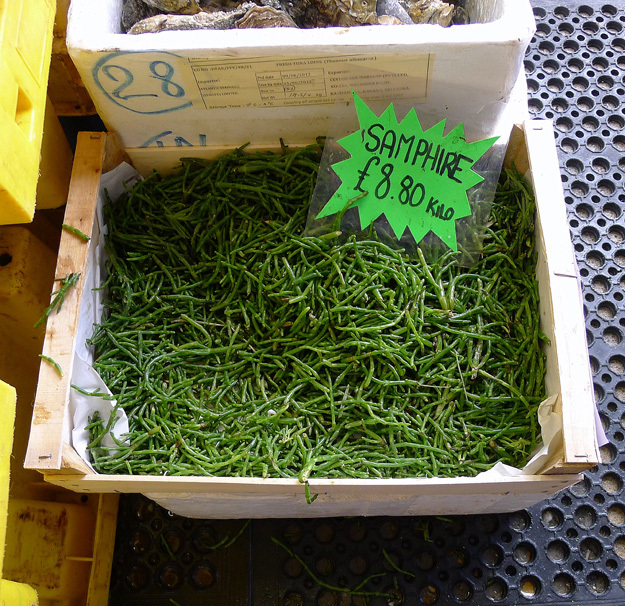 Samphire is a name used for a variety of sea vegetables, notably including glassworts. 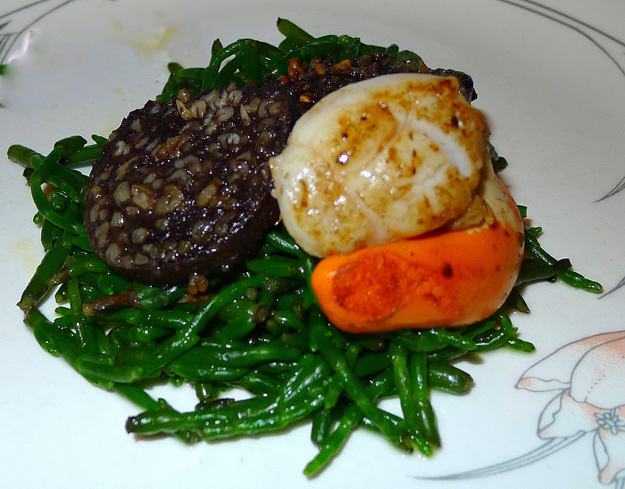 The Samphire at Leigh is sometimes called “sea asparagus” and, while that term accurately describes the taste of the stuff, it looked a bit more like “sea green beans.” Serving the Black Pudding over the Samphire topped by the Scallops was a no-brainer. The only real question was whether to use a sauce. While that was my first instinct it took only a moment to realize that the coral of the scallops would provide both the moisture and the uniting flavor that would be the purpose of a sauce. We elected to leave it simple and let the three gorgeous ingredients speak for themselves. Boil the water for the Samphire. Bring a large pot of water, liberally salted, to a boil. The salted water should have the same salinity as sea water. Prepare to Cook the Black Pudding and Scallops. Heat 2 tablespoons of the olive oil in a heavy sauté pan. In a separate heavy sauté pan (cooking both in the same pan will crowd the Black Pudding and Scallops and thus steam them rather than sautéing them) heat the remaining tablespoon of olive oil. Cook the Samphire. Add the Samphire to the pot of boiling water. 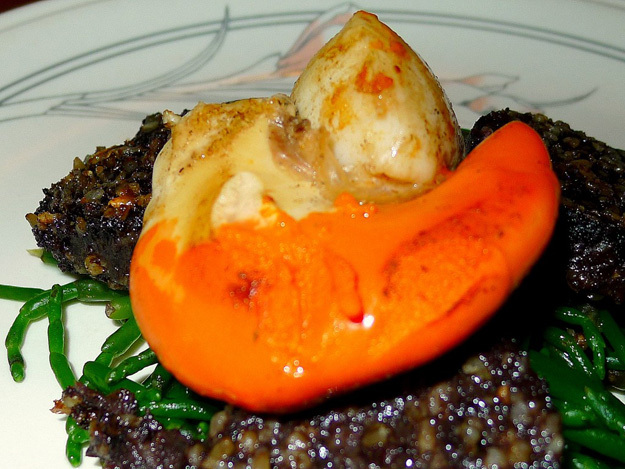 Cook the Scallops and Black Pudding. Pat the scallops dry with a towel and season on both sides with salt and pepper. Add the scallops to one of the sauté pan. Meanwhile, add the Black Pudding to the other. Cook each on high heat for 2 minutes per side. The goal with the scallops is to sear them on both sides. Remove the scallops and the Black Pudding from the pans to a plate and let them rest. Finish the Dish. Remove the Samphire from the pot and drain in a colander. Put the Samphire in a large bowl and add the butter. Toss the Samphire to coat them all evenly with the butter. Plate the Dish. Place some of the Samphire on each of the plates. Top with two to three slices of the Black Pudding (depending on whether you are serving the dish as a starter or (as here) a main course. Top with one of the scallops.